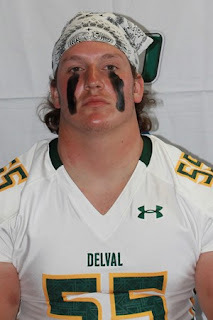 Nicholas DiGati (Delaware Valley / Sr., LB / Townsend, Del.) led the No. 12 Aggies to a 34-14 road win over Wilkes. The senior finished with 21 tackles, including eight solo tackles. His 21 tackles were one shy of tying the program single-game record. DiGati added 1.5 tackles for loss for four yards. The senior anchored a front-seven that allowed just 64 yards on the ground in the victory. 2016: Started all 11 games after transferring in from Williamson College of the Trades... Was named to the all-MAC first team... Led team with 81 tackles, including 18 behind the line of scrimmage... Also had four sacks, two forced fumbles and one fumble recovery... Began Aggie career with seven stops in win at No. 7 Wesley... Had 11 tackles (six for losses) and two forced fumbles in loss at eventual MAC champion Stevenson...Had 10 stops versus Lycoming... Named the MVP of the Centennial-MAC Bowl Series win at Muhlenberg... Recorded 11 tackles, a sack and a fumble recovery in the contest... Named to the Academic All-MAC Team and the MAC Fall Academic Honor Roll.